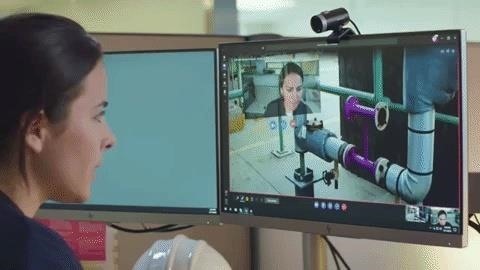 Four months after unveiling the latest productivity apps for the HoloLens, Microsoft now has a series of compelling real-world use case videos showing how the augmented reality device and its apps are helping oil giant Chevron. In particular, Chevron has benefited from using the Remote Assist app, which gives HoloLens users the ability to call remote experts and share their video feed, through which those experts can annotate the view and guide the caller through complex processes. 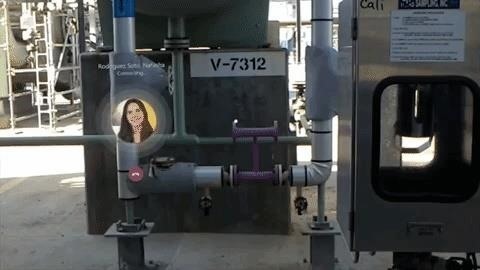 "Chevron is already achieving real, measurable results with its global HoloLens deployment," wrote Alysa Taylor, Microsoft's corporate vice president of business applications and industry, in a blog post announcing the addition of the apps to the Dynamics 365 enterprise software suite. By deploying the Remote Assist app, Chevron's distributed workforce can collaborate and assist each other remotely, cutting travel costs, reducing risk, and ramping up efficiency. For instance, Chevron inspectors are able to conduct their monthly inspections of a plant in Singapore from their offices in Houston, Texas rather than making the international flight. Also, inspectors can use the AR apps to remotely identify potential problems and approve changes. "We recognize that many employees need information in context to apply their knowledge and craft," said Taylor. "Not only on a 2D screen, but information and data in context, at the right place, and at the right time, so employees can produce even greater impact for their organizations. Mixed reality is a technology uniquely suited to do exactly that." Also included in the Dynamics 365 package is Layout, which enables users to create 3D designs through Windows Mixed Reality headsets and then visualize those designs in their physical space through the HoloLens. Microsoft's enterprise offerings for the HoloLens underscore the appeal of the current generation of augmented reality headsets for businesses as opposed to consumers. "The momentum that HoloLens has received within the commercial space has been overwhelmingly positive," said Taylor. "This has been supported by increased demand and deployment from some of the world's most innovative companies." Ultimately, the higher cost of the HoloLens and its bulky form factor, which are hurdles for mainstream audiences, seem to be offset for businesses by the overall improvements in efficiency and cost savings realized through the technology.